WE ARE CALLED TO LIVE OUR FAITH. WE BELIEVE THAT OUR HANDS DO GOD’S WORK, AND IF WE JUST LOOK AROUND, WE’LL SEE THERE’S MUCH WORK TO BE DONE. After School Ministry assists the teachers and helps with snacks during the school year from Monday to Friday. This program is coordinated by AFCAAM, Catholic Charities. Altar Servers Ministry assists the Priest at the Altar during our Church services. Altar Linen Ministry assists with cleaning and ironing church linens. Ministers only need work once a month..
Art and Environment Ministry is an opportunity to enhance the beauty and dignity of the Church by choosing decorative floral arrangements, Banners, etc. Eucharistic Ministry assists the Priest in administering Holy Communion in our Church services. 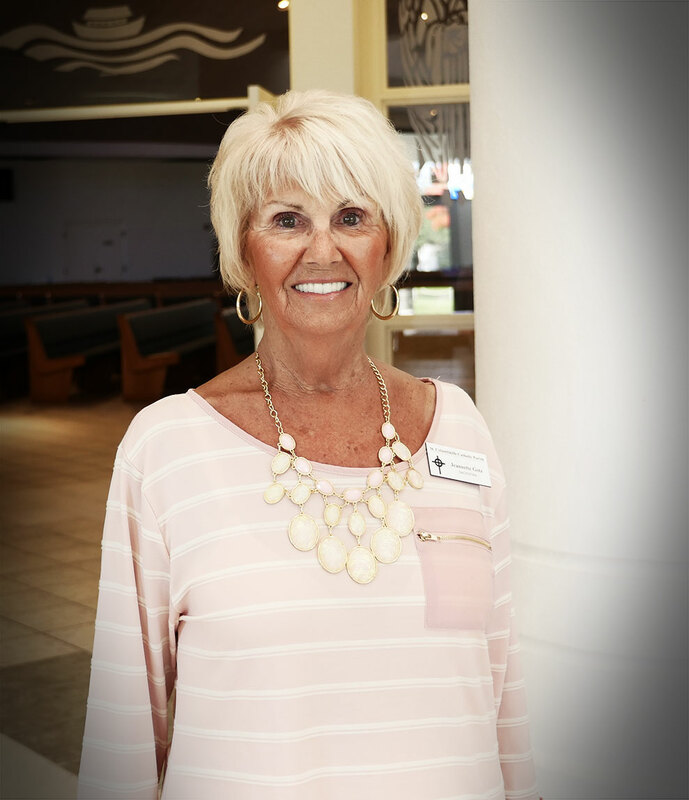 Faith Formation Ministry helps teach Sunday school, and Vacation Bible School. Sacramental Preparation will be offered at a different time. Funeral /Bereavement Ministry assists the Priest and staff in helping the bereaved arrange and plan funerals, and assists the family before, during and after the service. Homebound/Sick Ministry is for Eucharistic Ministers who wish to share their hope, faith, compassion and love to the sick at the Hospitals, Nursing Homes, Assisted Living Homes and individual family homes. Lector Ministry is an opportunity to proclaim the Word of God in our services. Liturgy/Sacristan Ministry helps the Priest before, during and after our services. Library Ministry is an opportunity for those who wish to help maintain our Parish Library and promote spiritual reading. Military Ministry supports our troops by sending packages from home, collecting a different item every month. Assistance is needed in arranging and shipping packages. Music Ministry invites you to share your gift of singing as Cantors and/or Choir members in our church services. Parish Vocation Ministry prays for Priests and helps promote Vocations in our Parish Community. Sewing Ministry is for those who enjoy sewing, knitting or crocheting. This ministry works on projects benefiting those in need. Thrift Store Ministry needs help arranging and cleaning items in the store and with sales. The profits of this ministry benefit many outreach programs. Transportation Ministry drives our parish bus to pick up parishioners who would otherwise not be able to attend weekend Masses and also transports students to after school program on weekdays during the school year. Ushers/Greeters Ministry offers an opportunity to share the joy of faith by welcoming and accommodating those who are attending St. Columbkille Parish. Visual-Projection Ministry members are needed at every weekend Mass to run the announcements and order of service on the screen in church. No experience is necessary, just a desire to serve. Young Family Ministry assists young families with children who are looking to grow spiritually and helps them find new ways to keep our Christian Values. Youth Ministry helps the youth at Sunday 5:30pm Mass and assists with youth group activities. New Events Ministry members are needed for decorating, setting-up tables, collecting tickets at the door, clearing tables, end of event cleanup, etc. for a variety of church-wide events, such as dinners, concerts and spiritual events within the calendar year. Dip your toe into the waters of service. of the wonderful ministries here. The After School Reading Program grades K-5 runs from September through June, Monday through Friday from 2:30pm until 5:30pm. This after school program is run by The African Caribbean American Catholic Center (AFCAAM) which is a part of Catholic Charities. The program will begin again in September 2017. If you are interested in working with the students or driving the school bus please contact Janet Sushil at the Parish Office. Faith Formation is a free Sunday School Program for children Pre-K through 8th grade. Please consider becoming a Catechist and sharing your faith, your time and talents with the children of St. Columbkille. Contact Jeannette Gotz at the Parish office for additional information. Volunteer to become a Catechist for our Youth Group. Assist with providing vision and coordination for the parish’s efforts in this ministry to young people from 9th through 12th grades. Or help the Youth Group with events they are involved in or trips taken during the year. The Youth Group will meet Sundays (Not every Sunday) after 5:30 pm Mass. Contact Manya Vartdal at the Parish office or mail mvartdal@stcolumbkille.com for additional information. It is an opportunity for those that wish to assist the Priest in administering the Eucharistic body and blood of Christ during our Church’s services. The action of ministering the Eucharist is, above all, a service of love performed in faith for the good of the community. The minister’s action is an invitation to share in the Eucharistic feast. A Eucharistic Minister should be welcoming, open and affirming. If you are interested in serving God and our community as a Eucharistic Minister please contact JoAnne Bertuch at the Parish Office. A lector is the person who proclaims the first or second reading at Mass. This person also may lead the Prayers of the Faithful at Mass. This ministry in the Church requires a person who is of excellent character and serious about the practice of their faith. The lector must believe that Sacred Scripture is the Word of God and have deep respect for God´s presence in that Word. If you are interested in becoming a Lector please contact JoAnne Bertuch at the Parish Office. Servers carry the cross in the entrance procession for Mass. Servers hold the liturgical books for the celebrant . Beginning of the Liturgy of the Eucharist: Servers arrange the corporal, the purificator(s), the chalice(s), the pall, and the Missal on the altar, and then assist the celebrant in receiving the bread and wine and perhaps other gifts that are presented to him. They present the cruets of wine and water for the celebrant to pour some into the chalice. When the celebrant then washes his hands standing at the side of the altar, a server pours the water over them. Recessional: The servers lead the celebrant and any concelebrants as at the entrance procession. For additional information on becoming an altar server please contact Fr. Lorenzo at the Parish Office. Ushers greet and welcome mass attendees at the church entrance ways. Also, they assist attendees as needed with finding a seat, paying particular attention to those with special needs. During crowded services, assisting with seating is especially important. When late-comers arrive, ushers help minimize disruptions by asking them to momentarily stand by during the readings and the priest’s homily. Ushers are also responsible for passing around the collection baskets. During communion, they assist the eucharistic ministers by pointing out those who cannot proceed through the communion line and therefore need communion brought to them. Please contact Parish Office for additional information on becoming an Usher. This ministry is for those that wish to enhance, the beauty and dignity decorating our Church with flowers or keeping our plants watered and taken care of. We would also need volunteers during the holiday seasons especially Christmas and Lent with decorating our church. Please contact Jeannette Gotz at 239-292-3512. This is an opportunity for those Eucharistic Ministers who administer Holy Communion that wish to share their joy, hope, faith, compassion and love to the sick at the Hospital, Nursing Homes, assisted Living and homes. Contact Deacon Jim at the Parish Office for additional information. The Bereavement Ministry serves families who have lost a loved one to death. The members of this ministry will meet with the family and will implement our mission to give comfort and support to them. You will assist with the planning of the funeral or memorial service and will assist during and after the service. Please contact the Parish office for additional information. At every Mass there are one or two people who oversee the set up for Mass as well as assist the priest during Mass. The official title for this ministry is sacristan. We are currently in need of additional sacristans for weekend, weekday and funeral Masses.Please consider serving God and our community in this way. Please contact Fr. Lorenzo or JoAnne Bertuch at the Parish office if you would like additional information. It is an opportunity for those who wish to help keeping and maintaining our Parish Library and promoting spiritual reading. Your commitment will be one hour a week to help manage the library. If you are interested in joining this ministry, call Marie at 230-481-1437. This ministry needs help driving our parish bus to and from Masses on the weekend on either Saturday or Sunday. We also need drivers for our after school program to drive children from Harlem Heights Elementary School at 2:30pm to St. Columbkille weekdays during the school year. Please contact Peggy O’Rourke at the Parish Office for additional information. The Sewing Ministry will resume meeting in September twice a month. The ministry works on projects benefitting those in need in our community. Knitting and crocheting are included as well as sewing. For more information contact Pat Gregg at 239-432-9905. Help is needed for our Altar Linen Ministry. The church linens need to be cleaned and ironed. Contact Mary Wambaugh for additional information. Our Thrift Store in the K-Mart shopping plaza is looking for people to help in the running of both stores. Volunteers would be responsible for receiving items, cleaning, pricing and setting out items on display. We also need help at the front desk of the store answering the phone, customer check out and other miscellaneous duties. No experience is necessary; we will train. Contact Molly or Jan at 239-489-4001 for more information. Throughout the year we support our troops by sending packages from home, collecting a different item every month. For additional information please contact Pat & Paul 239-481-8333. Projectionists are needed at every weekend mass, projectionists are responsible for running the announcements and order of service for the mass. Make your own schedule whether it’s every week or once a month. No experience is necessary, training will be provided. Please contact JoAnne Bertuch in the Parish Office. 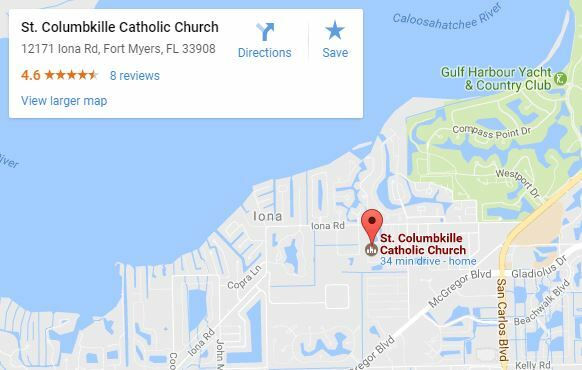 St. Columbkille Parish is comprised of a team of dedicated individuals who is responsible for the coordination, decorating and setting-up tables, collecting tickets at the door, clearing tables, end of event cleanup, etc. for a variety of church-wide events, such as dinners, concerts and spiritual events within the calendar year. The special events ministry strives to organize fun and entertaining celebrations that foster growth and fellowship among the members of the St. Columbkille church family and the community. If you are interested in volunteering for our New Events Ministry please contact Manya Vartdal in the Parish Office. You can volunteer for one event, or two, or all….it’s up to you. We look forward to hearing from you and forming this new Events Ministry. We are totally convinced that bringing people closer to God involves direct service to those in need. From the material, to the spiritual, God’s work is never done.